“Doing an Everton” is now a popular saying for football fans referring to a side getting off to hideously poor starts to a campaign – and this year is no exception, as we fall to a 1-0 opening day home defeat against newly promoted Queens Park Rangers. There was a feeling of optimism across the fan base going into the game – after all, we had dodged a bullet with the Spurs game getting called off (and seeing them promptly smash apart Hearts confirmed that good fortune), we would start the campaign against a side that just shipped four goals at home to Bolton and, most importantly, weÂ´d be at home. Yet…. the fans amassing around Goodison Park were eerily quiet before the game. Indeed, I heard only one set of chants and that was from QPR fans being shepherded by police. The reason why is clear – it was the start of the season and, being knowledgable football fans with fairly long memories, we all know that we get off to a slower start than your average milk truck. Things never go according to plan for Everton in August. The teamsheet confused everyone. Enjoying a pre-match pint of Chang in the corridors inside Goodison, everyone was looking up wondering who on Earth the wide players would be. It turned out to be Jack Rodwell on the right wing for the first time in his career, and a professional debut for Ross Barkley on the left wing – again, a position heÂ´s never played in at any level. Add to that we play a World Cup finalist centre-half in John Heitinga in the centre, whilst Tim Cahill completes a 4-5-1 – all whilst Mikel Arteta, Marouane Fellaini and Louis Saha are apparently deemed fit enough for the bench. The confusion was heightened when I quickly recall that Victor Anichebe had started every single game of pre-season in a wide position, yet had been left on the bench for the first competitive game of the season. Surely if the plan was to use Rodwell and Barkley, then a runout for them in that position prior to kicking of a Premier League campaign would have been smart? It was square pegs in round holes all over the team, and nothing worked. Phil Neville and Jack Rodwell spent the entire first half running into each other. Barkley on the other side was much more lively, but only when he picked the ball up and cut inside to his favoured central role. Cahill and Beckford were too far apart to combine to any meaningful extent, with both men producing lay-offs to invisible players throughout. Yet for all these failings, Everton had the better of the first half, as QPR were even worse. Taarabt was anonymous, and Agyamang was only notable for wasting six minutes on the floor with an “injury” that required a stretcher after heÂ´d actually stood up for a minute. 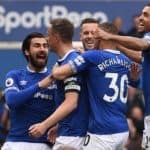 The goal from Tommy Smith was after Leighton Baines cannoned a free-kick off the underside of the bar, and was a result of terrible defending from the poor Phil Jagielka who badly underperformed on the day. Tim Cahill missed an open goal at the far post late on from a Phil Neville cross. But those two chances aside and a decent outing from Barkley, there was nothing for the Evertonians to applaud as we went in at half time 1-0 down. From there, it went from bad to worse. Everton could not string two passes together. When they did, it was meandering, aimless with absolutely zero movement from the attacking players on the pitch. Passes were smacked out of play, touches were overran. A better side would have done us over by a good three or four goals in the second period. Jack Rodwell was unceremoniously hauled off after a shocking shot on goal early in the second half, but the substitution that caused the most controversy was the replacement of Jermaine Beckford on the hour mark for Marouane Fellaini. Granted, Beckford had not had the best of games, but replacing a striker with a midfielder and going 4-6-0 whilst losing 1-0 to a newly promoted club at home whilst a quality striker in Louis Saha was on the bench was appalling, and produced the first of a few boos from the Goodison faithful. The final whistle, however, produced the loudest most sustained booing heard in Goodison for many of a year. Not necessarily at the players, but at the board, the chairman and, yes, the manager, who got it desperately wrong today. The season isnÂ´t over yet, and perhaps this will be a wake-up call for Bill Kenwright who watched this game grim-faced in the crowd. 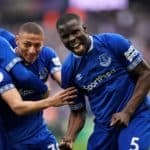 If we do not delve into the transfer market in the two weeks, Everton could find themselves struggling against the relegation spots rather than the European chasers.